SMARThome.eu :: How to create KNX design and installation? SMARThome.eu / Offer / Guidebooks / How to create KNX design and installation? How to create KNX design and installation? Installation specialists and smart home system designers often seek answers to those and many other related questions regarding design and implementation of KNX/EIB systems. Browsing hundreds of pages of general information is time-consuming and ineffective. This, however, can be avoided. The main equipment and most important features of the system, distinguishing it from traditional installations. Methods of executing and documenting the design. The list of sections that should be included in the design. Rules of installation design, illustrated with ready diagrams and schematics. Step by step we will guide you through the system installation process. We will also tell you what you shouldn't forget about, and what to pay particular attention to. The guide focuses on help in situations typical for installation specialists and designers during execution of smart systems. Numerous examples show typical or special, recommended solutions. Thanks to them you will be able to quickly evaluate which subsystems will prove themselves in a given building. The text contains many diagrams and illustrations. Through their analysis it will be easier for you to practically implement the knowledge gained from the examples shown. Even up to 25 000 EUR – this is its value after you have taken a few orders for the execution and implementation of KNX/EIB designs. 57 EUR – you only pay this much when buying the guide 'How to create a KNX/EIB design and intelligent installation? ', gaining access to these materials at any time, anywhere you need! Now you can have all the most important information always at your fingertips. Trust over 12 years of experience of SMARTech specialists. 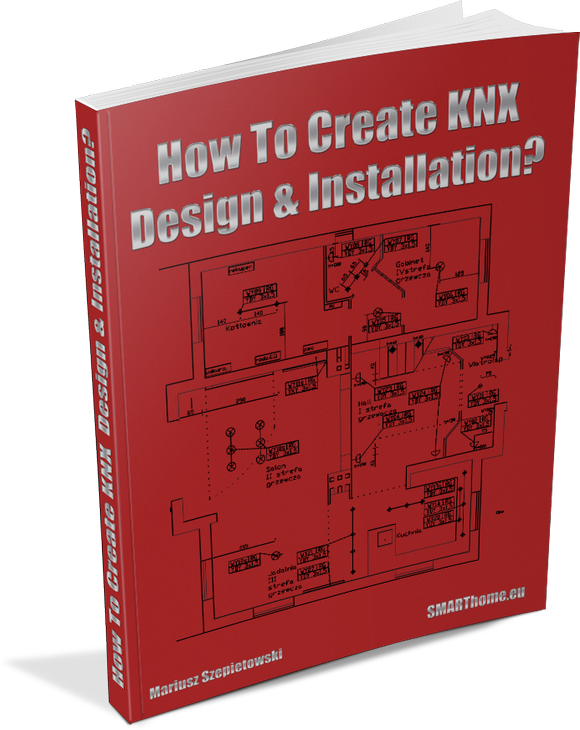 Order your guide 'How to create a KNX/EIB design and intelligent installation?' today for the special price of 57 EUR (the price rises with each new addition, present customers will receive all future updates, so it's worth buying quickly for a lower price). Bonus 1: special report: Which KNX/EIB system to choose? How to select the most suitable system for a particular building? What are the prices of the individual components of the systems in relation to the data transmission medium? You will also read about three types of control media: radio waves, the electrical power network, and the system bus. Bonus 2: 20 pages about 14 smart home systems available in Europe, including a table comparing their 36 features in detail. The subject of smart systems is very young and constantly developing, so there is a lack of technical publications about it in book stores and the Internet (there are a lot of advertising texts, but no concrete information), and that is why I was very happy, when I found the website SMARThome.eu when browsing the pile of online garbage, with its broad technical guidebook department (targeted at designers and installation specialists). Having acquainted myself with the titles, I chose the guide 'How to create a KNX design and installation' - just hard facts, no advertising babble, everything clear, arranged as it should be, and what's most important, including very valuable tips which greatly ease the preparation of installation designs for KNX. Having read this guide it dawned on me how little I know about this subject, that is why I had decided to obtain one more - 'How to build an electric switch cabinet for the KNX system' - and it didn't fail me also in this case. Upon reading both of them I must say that they are the must-have literature for any designer or electrician willing to create intelligent installations. Don't waste time looking for information - order now the guide 'How to create a KNX/EIB design and intelligent installation?' - get the free special report 'Which KNX/EIB system to choose?' and make use of valuable tips as gathered and used by professionals.